Our profession is full of accountants and bookkeepers that have worked hard to build their practices. They’ve got many admirable attributes in common – smart, hard-working, accurate and technical experts. Only a handful, however, have reached the pinnacle and attained the mantle of "Trusted Advisor,” or Firm of The Future. Ironically, the very skills, focus and mindset required to excel in the fields of audit, tax and compliance are the polar opposite of the ones that are actually required to excel in the disciplines of strategy, advisory and coaching. While most are already seen as financial experts, very few are seen to have expertise and insight. And, here’s the thing … the client will always pay more money for expertise and insight because their perceived value to the business is much higher. How can You Make the Shift Quickly? As an accountant or bookkeeper, you are already a deep subject matter expert in all things financial. Unfortunately, most of what you do is focused on the numbers that describe the past and present of the business. Compliance (and even dashboards and KPIs) help answer the basic question of WHAT has transpired in the business to date. However, these tasks are highly price-sensitive, the scope of work is limited and it is almost impossible to leverage them to create influence with your client. In order to create influence, you must move into the domains of WHY and HOW – these simple, three letter words hold the key to helping your clients move forward. Coaching and advisory are the gateways to WHY and HOW, respectively. 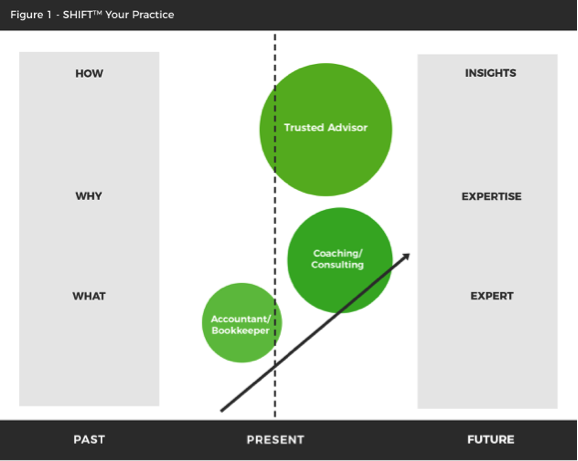 Figure 1 sets out the gateways and illustrates the path from accountant/bookkeeper to coach and ultimately trusted advisor. While all dimensions require deep subject matter expertise (that is a given), only the trusted advisor possesses the key set of skills, focus and mindset to leverage specialized financial knowledge in a way that is impactful and influential. Using WHY and HOW to Become a Firm of The Future? The acronym SHIFT summarizes the five key strategies you must put in place to become a Firm of the Future. 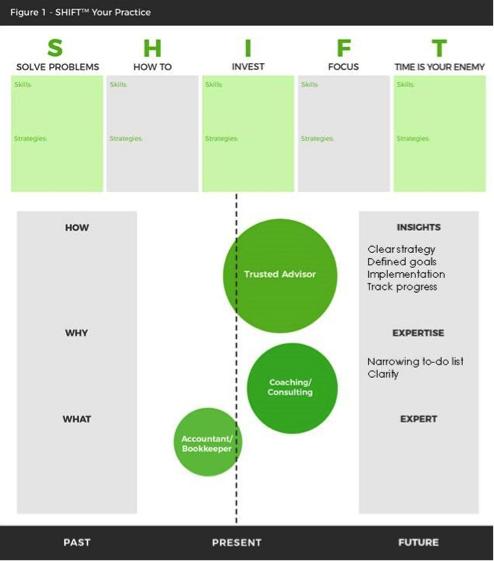 Each of the five letters that spell S-H-I-F-T represent the first letter of a strategy that will help you make the shift from compliance to advisory. Every client you have is experiencing pain points in some aspect of his/her business – these are the things that worry them and cause them to lose sleep at night. Key pain points may include lack of cash flow, difficulty finding good staff, finding more customers, lack of work/life balance and productivity challenges. Curing these sources of pain is of enormous value to your clients, but it will require much more than historical financial reports and analysis. Financial pain is about lack of results, and most companies will measure how they are doing by a key performance indicator. Strategic pain is often more difficult to measure, but is just as significant and is usually tied to the way the organization goes about producing, distributing and selling its products or services. Personal pain may reveal itself as work/life imbalance, difficulty sleeping, strained relationships, excessive stress, indecisiveness, bad habits and fear of moving forward. Once you have pinpointed the key pain points, you can then spend some time identifying and documenting the key strategies and steps that your clients must take to cure them. Practical insights and powerful step-by-step instructions will move you from WHY to HOW – and into the domain of the Firm of the Future. It’s vital to critically evaluate the reports, dashboards and graphs that you currently present to your clients. Remember, your clients are not accountants and they have no desire to learn accounting. If you aspire to become the trusted advised, you will need to help them fix the key pain points quickly and easily, so they can just focus on making more money doing what they love. Where an expert focuses on "telling" and providing answers, a coach or trusted advisor listens, asks great questions, offers insights and collaborates with their client to uncover the solutions across all disciplines, not just the financial stuff. To move toward WHY, it is imperative to get in front of your client regularly and open a dialogue with them. You are not expected to have all the answers, but you will be expected to lay the foundation, provide focus, and assist your client to explore questions and options before arriving at decisions. Finally, as you move toward HOW, you will need to identify and develop the materials and apps you need to gain leverage on your clients and empower them to take action. When in doubt about which apps and materials to use, ask for advice from trusted colleagues with proven experience in delivering impactful advisory services. It doesn’t make sense to waste time reinventing the wheel. Remember, trusted advisors are always open to new ways of doing things, and this includes technology, processes, communication styles and delivery channels. A key component of the shift from WHAT to WHY and HOW are the core skills and competencies that you must acquire in order to execute the transition seamlessly. You will need to identify and document the requirements for each team member, based on his/her role in helping your firm to achieve the results you are striving for. Movement toward WHY will primarily involve soft skills, often associated with coaching and consulting. These skills can be taught, and are appropriate for all levels of professionals in your firm, including new hires fresh out of school. Ascension to HOW involves mastery of both WHAT and WHY, along with the ability to break down strategies into step-by-step instructions, visuals and storytelling. When your clients become engaged and accountable in the process of learning and growing, your ability to create value increases exponentially. Training is not a one-off exercise; it’s a lifelong commitment for anyone who is serious about becoming a trusted advisor. Money spent on you and your team’s skills to deliver effective solutions is far more impactful and cost-effective at growing revenue and net profit than advertising and social media. As you move from accountant/bookkeeper to coach and then trusted advisor, the number of issues that you choose to highlight to your client will dramatically decrease. That’s because the amount of focus/clarity you provide is directly proportionate to the amount of value you add. If your client leaves your office (or a meeting with you) and still has 30 items on their to-do list, you can safely conclude that you are not a Firm of the Future. Because focus is essential to your role as a trusted advisor, you also need to become crystal clear on what you need to do to grow revenues from advisory services this year. If you are unable to articulate a succinct and clear plan for yourself, you will struggle to assist your clients to obtain the required level of clarity. The first has to do with automation. The second is due to the evolution of the client’s needs – they have come to expect and demand more because they have access to more options regarding where they can get insights and guidance. Accountants/bookkeepers sell time, but a Firm of the Future sells insights and THE solution to the problems that are keeping his/her clients up at night. Instead of merely charging based on the time involved, you now have the option to take into account the potential value you can deliver. Some refer to this as "value pricing," but I like to think of it as "impact pricing." In essence, as you move from WHAT to WHY and HOW, your pricing strategy will increasingly take into account your long-term business relationship and the overall impact you can deliver based on your knowledge, skills, focus and mindset. 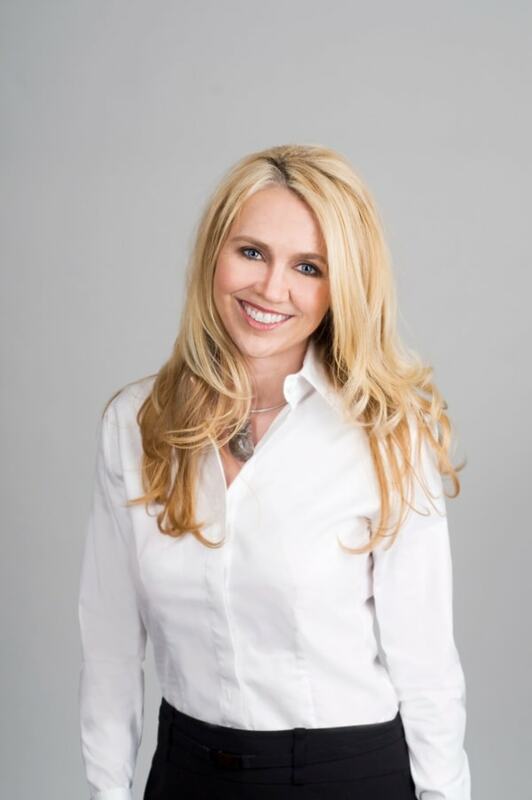 Rhondalynn Korolak, founder of businest® and Make the SHIFT™, is a lawyer, chartered accountant, business coach, author and expert on making the shift to advisory. She’s produced a simple step-by-step process that any accounting or bookkeeping practice can apply to attract more high-value customers, generate recurring revenue streams and grow profitably.